“Ouch!” Emmy squawked as I brushed her hair up into a pony tail. I looped the pony tail holder around several times, and then I squawked when I saw an unruly clump of hair sticking out of the back of Emmy’s head. Emmy was not happy when I took the rubber band out of her hair to start over. I smoothed hair gel into her pony tail and pinned it up into the required bun. This time, there were no clumps. Emmy’s long eyelashes blinked furiously as I tried to put a touch of mascara on them. 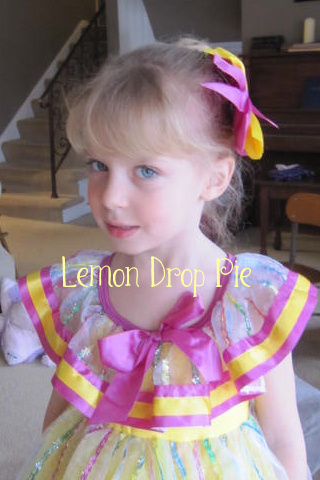 I swept a little blush on her cheeks, she stepped into her tutu, and she was ready to go dance! As usual, Mommy was more anxious than Ballerina. I was a bundle of nerves as we headed out the door…not so much about her performance, but more about the long wait she would have before she went on stage. I would be in the audience watching the show. What if she got nervous and wanted me? What if she needed to go potty? What if she lost her shoes? While I was waiting for the show to start, I went out into the lobby to order the DVD. I didn’t want to be looking at a glowing digital screen during Emmy’s performance. I wanted to be fully present and accounted for. I’ve been guilty of staring at a screen full of pixels while trying to record my daughter’s special moments. This time, I wanted to see her dance with my own eyes. Emmy is smack dab in the middle. Emmy held my rapt attention the entire time. Her little chubby five year old legs tip-toed back and forth across the stage to Kermit singing “The Rainbow Connection.” At the end of their dance, I could see her face beaming as the audience clapped for all the little girls. I’m writing about “4.) Write a blog post inspired by the word: Dance.” for Writer’s Workshop today. I have been meaning to stop by for so long but I've been so behind on my reading. She is so beautiful and those eyes!!! I was thinking about the whole taping versus real watching. I used to tape all my kids sports and you do miss the moment. I'm glad you were Smack dab in the middle for this one! I would be the same way, more nervous than the ballerina… Kids are tough! Yes, kids are often more resilient than we think they are! How so very cute! 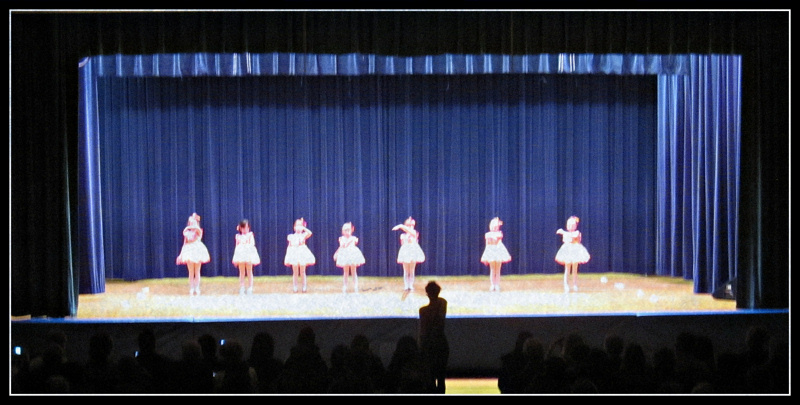 Aww, I miss the days when my 2 girls were in ballet too. But it got to be too much for us, what with the performances outside of the studio – for recruiting purposes… I think I might consider putting them in ballet again as long as we don't have to do "recruting performances." We just take classes through the park district, so they are pretty basic! It sounds like recruiting performances would be too much for us, too! I remember those days well. I remember feeling that same way. What a great song too! Glad it all went well for her. Thanks! I just love that song, too. They did a nice job. Good for you on not taking pictures. I don't know how many of my girls special moments were lost because of trying to take pictures. How much better to order a DVD! Oh, Ginny, my girls were dancers. Danced right on through Snow Queen in the Nutcracker. This took me back to the beginning and left me with a sigh! Yay for Emmy! I totally know what you mean about being present. Sometimes instead of just experiencing the experience, I'm so busy tweeting about it. I'm glad they offered DVDs! It's so tempting to stay behind that screen, isn't it? I'm glad they have DVD's, too! I go with the flow and let my daughters decide what to do at this age, too. It's better that way! I remember being the little ballerina, although it didn't work for me in the long run and I quit long before my two sisters were finished with their recitals and tutus and braids. My daughter wants to take ballet in the fall and I forsee a lot of what you described in our future! My recent post Bye Bye Birdie. Awww! This post brings back a lot of memories. My daughter was in dance from K through 9th grade. She absolutely love it! That's so nice! I don't know how long Emmy will want to dance, but I'm willing to let her do it as long as she wants to. Yes, I'm so glad that I let the professional do the video taping this year! She is just beautiful. 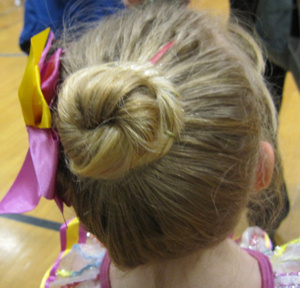 I remember doing my daughter's hair for ballet. It was always a very trying experience. My recent post You Bred Me With Him? Thank you! I have had a terrible time making buns, especially since my daughters have thin, fine hair! I love the photos! I understand what it's like not to be fully present because I'm staring at a bunch of pixels. Looks like all that mommy worry was for nought because she did a fantastic job. Beautiful! Fortunately, all my worries usually are for naught! I just shouldn't worry in the first place!